The Texas Rangers won the American League pennant last year, and a rational prediction of their chances this year would have to take that recent success into account. But rational is not how things work here. 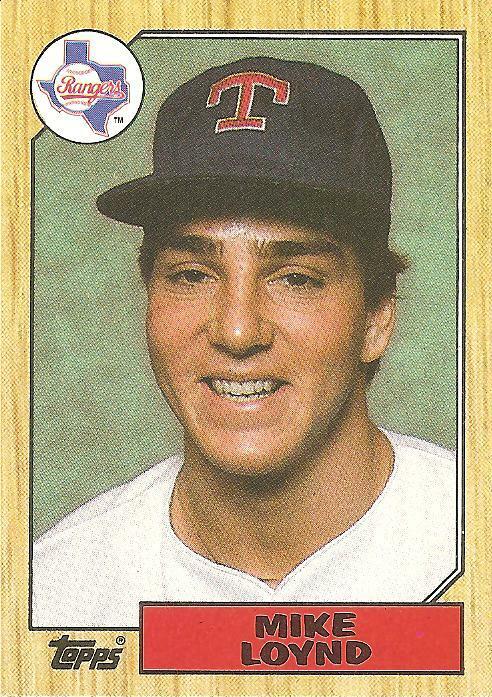 Here the idea, based on nothing, is that the 2011 Rangers squad will resemble the thoughts that arise from the consideration of 1987 card of someone named Mike Loynd. I got this Mike Loynd card last year in a pack that came with a copy of the book Mint Condition that the book’s author, Dave Jamieson, sent to me. Near the beginning of the book’s entertaining exploration of the history of baseball cards, Dave locates the center of his own personal connection to baseball cards in the 1987 set, his favorite from childhood. My own childhood came a little earlier, so my first look at the 1987 set occurred when I opened the pack that came with Dave’s book. The pack had a piece of ancient gum inside it. I had never opened a pack of baseball cards with gum inside and not chewed the gum, but since the gum in question was over twenty years old, I hesitated. Generally speaking, food that old doesn’t do wonders for the human body. The thought occurred to me, What if I eat this gum and it kills me? Paradoxically enough, this question is what prompted me finally to put the decrepit gum on my tongue. I figured if I was going to die, I might as well die from gum in a pack of baseball cards. The gum crumbled instantly from the slightest chewing pressure, and then, instead of reforming from crumbles into a chewable wad, it just dissolved. The jolt of sugar from baseball card gum is to me the primal accompaniment to the stretched moment of discovery of leafing for the first time through a new pack of cards, but in this case the gum was gone but for a stale, pasty aftertaste before I’d looked at more than a couple cards. When I got to this Mike Loynd card, I was vaguely thankful that I wasn’t convulsing on the floor like a poisoned medieval courtesan, but I was also a little disappointed that I wasn’t able to blow one last baseball card gum bubble. This is life, right? Most of the time you have to admit you’d rather be alive than not, but even so there’s a powdery residue on your tongue of some idealization of long gone sweetness. There’s a taste of disappointment. With that taste on my tongue, I wondered, Mike Loynd? You are currently browsing the archives for the Mike Loynd category.